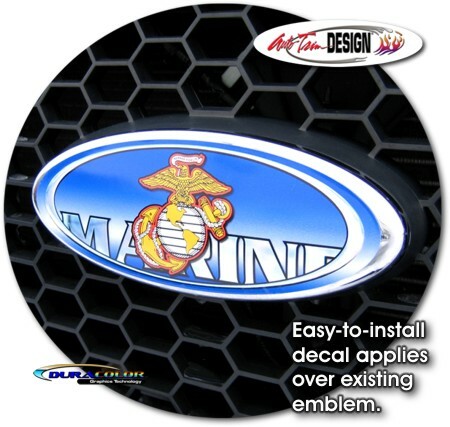 Detail your Ford truck or SUV with this themed U.S. Marine Corps decal that fits perfectly on the oval factory emblem of the vehicle's front grille or rear gate. The decal is uniquely designed so that it fits on the Blue logo area, leaving the emblem's Chrome trim to outline the new decal as shown. Decal features a faded Blue background with simulated Chrome outline and highlights as shown in the image.